Perhaps the most important advantage of this rather high-end portable freezer and refrigerator is its unrivaled versatility. It can be used for so many different tasks and in so many different environments that it eliminates the need for any other complementary device, offering it excellent value for the money. The possibility of powering it with different voltages and current types is a key feature: it comes with one 12V DC, one 24 V DC and one 110 VAC power cords so that it can be used in a car, boat, RV or attached to a shore power source. It is compatible with humid environments and will work even under hot outdoor temperatures. Even though it has been appreciated for its technical performances, the design has some annoying flaws which reduce its ease of use and can prove quite challenging to fix. The opening is on one end while the temperature indicator and the light are on the other end, making it difficult to read the temperature or seeing if it is on or not when it is facing a small cabinet. This issue is further complicated by the lid, which might not fit well, and it could come off if hit or misused. The design flaws include the not-so-good insulation on the lip, which might not tightly fit the fridge. This is one of the reasons behind this product’s popularity and the main reason why customers opted for this design. Featuring a high-impact polyethylene exterior which is durable and weather resistant without making the model too heavy, it can be easily carried from one place to another by hand. Suitable for RVs, cars, and boats, it is pretty compact and will fit on the back seats or in a single cabinet without requiring any other adjustments. Ergonomically shaped carrying handles enhance its portability, offering you a firm and secure grip even in humid environments or when fully loaded. 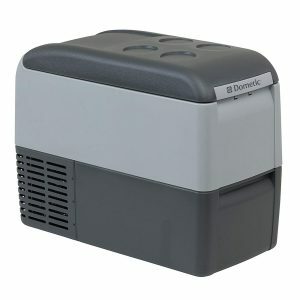 Another critical aspect of making the Dometic Portable Freezer a desirable choice is its increased power. It can reach the desired temperature in a relatively short amount of time thanks to the performant compressors used for this design. The motor driving them allows you to keep food at the desired temperature regardless of the weather conditions. Even though it is very powerful and will usually reach the desired temperature in a timely fashion, it is also economical, so you do not need to worry about it discharging the batteries or consuming too much energy. The engine is also quiet for increased user comfort, without sacrificing its efficiency. 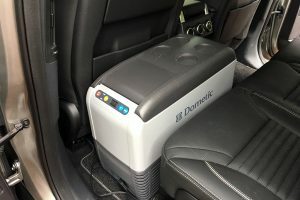 One remarkable aspect about the Dometic Portable Freezer is how functional it is. Thanks to a compact outer shell fitted with ergonomic handles, it will not occupy too much space, yet it will allow you to take enough food for longer road trips. Useful for storing vegetables, meat, fruit, and beverages, the compartments are well positioned. Functionality also comes from its compatibility with a solar panel system. As a result, it can also be used as an extension for a regular fridge when extra space is required. It can be powered by 12 or 24 V DC or by 110 VAC, enabling you to use it for many different situations.